This form is a 9 1/2" x 11" sheet with 1/2" marginal perfs on both sides. 2 additional horizontal perfs are positioned every 3 2/3" dividing the sheet into 3 equal parts. Each carton contains one continuous ream of 7200 forms. 1/2" Marginal Perfs on Both Sides. 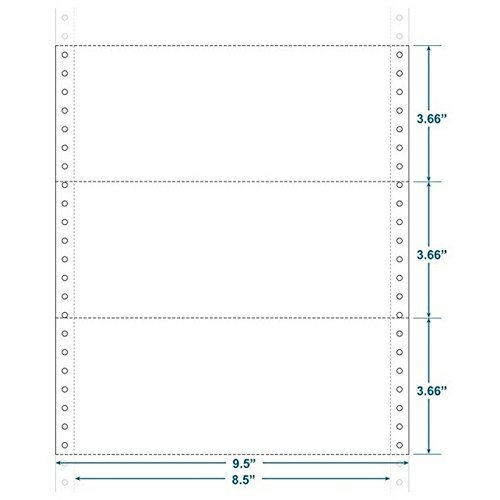 2 Additional Horizontal Perfs are Positioned Every 3-2/3"
If you have any questions about this product by The Business Form Supplies Shop, contact us by completing and submitting the form below. If you are looking for a specif part number, please include it with your message.